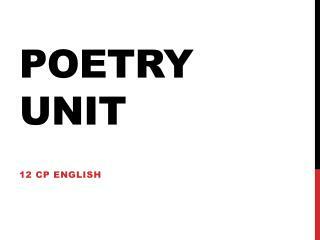 Unit 3: Poetry. Structure and Form. Poetry lifts the veil from the hidden beauty of the world, and makes familiar objects be as if they were not familiar. —Percy Bysshe Shelley. <skip intro>. 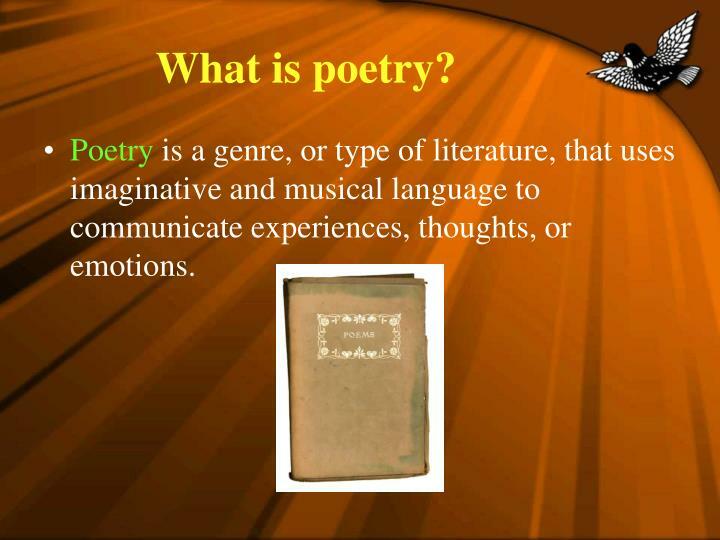 What is poetry?. 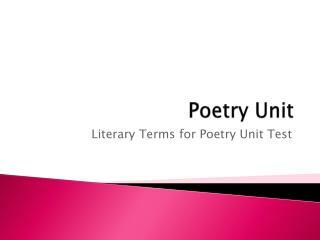 Poetry is a genre, or type of literature, that uses imaginative and musical language to communicate experiences, thoughts, or emotions. 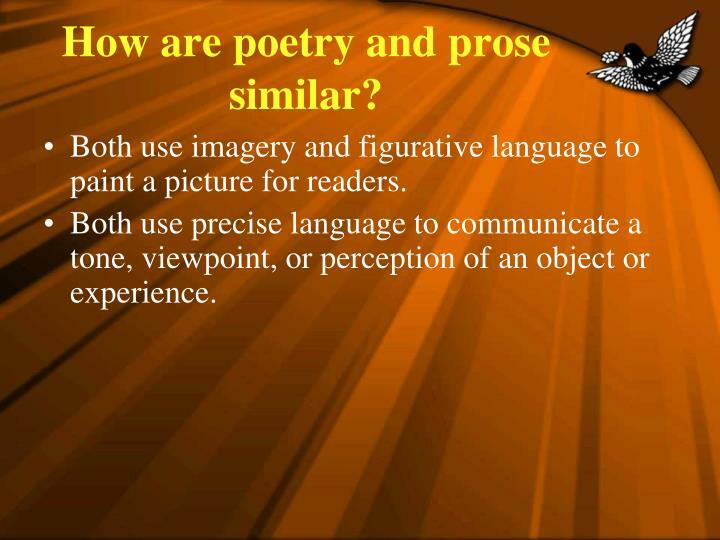 How are poetry and prose similar? Both use imagery and figurative language to paint a picture for readers. Both use precise language to communicate a tone, viewpoint, or perception of an object or experience. 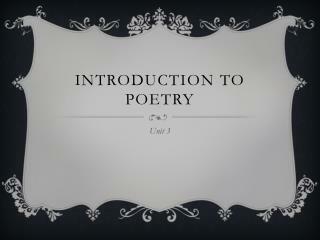 How are poetry and prose different? 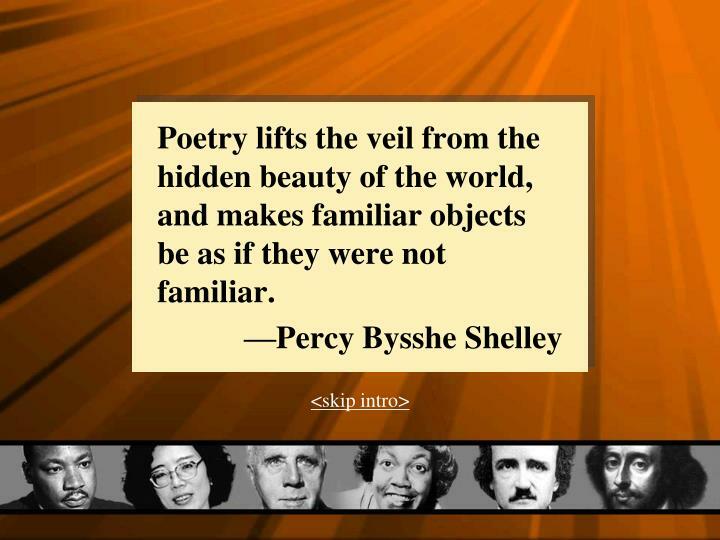 Poetry reduces meaning into fewer words. 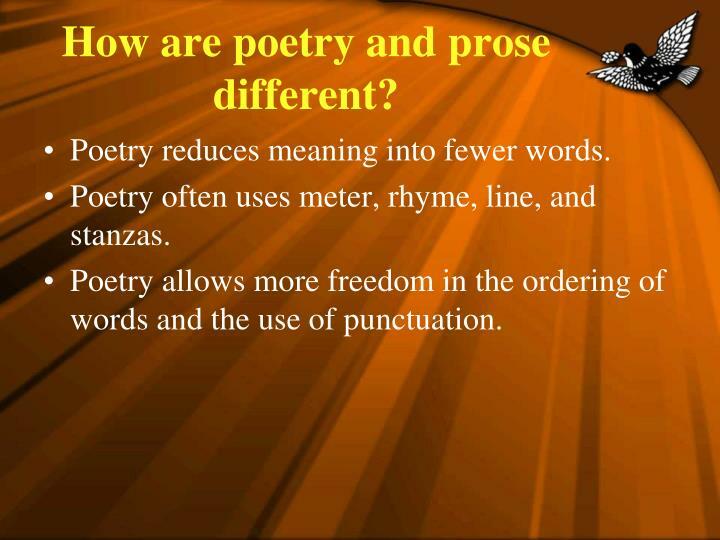 Poetry often uses meter, rhyme, line, and stanzas. 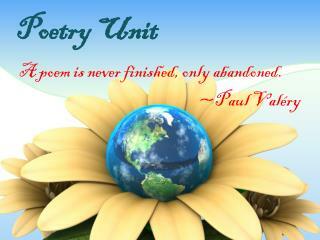 Poetry allows more freedom in the ordering of words and the use of punctuation. 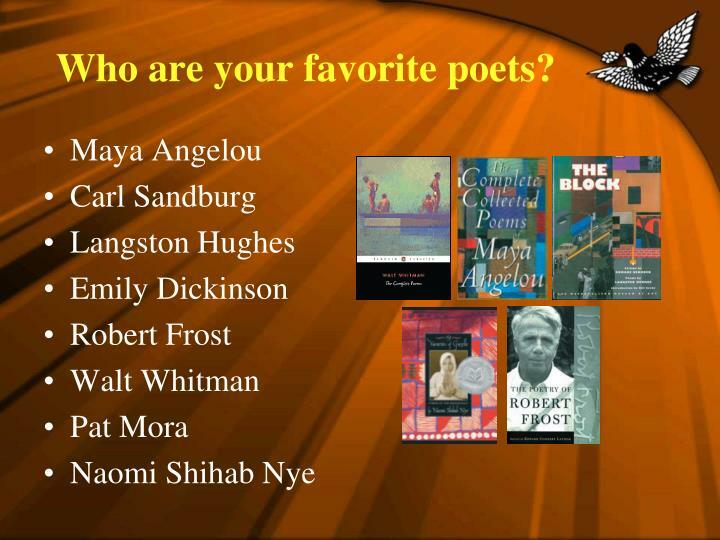 What are your favorite types of poems? 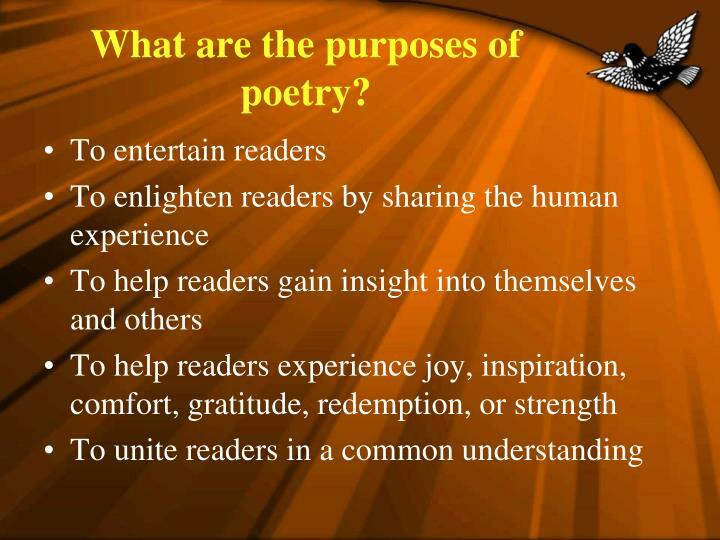 What are the purposes of poetry? 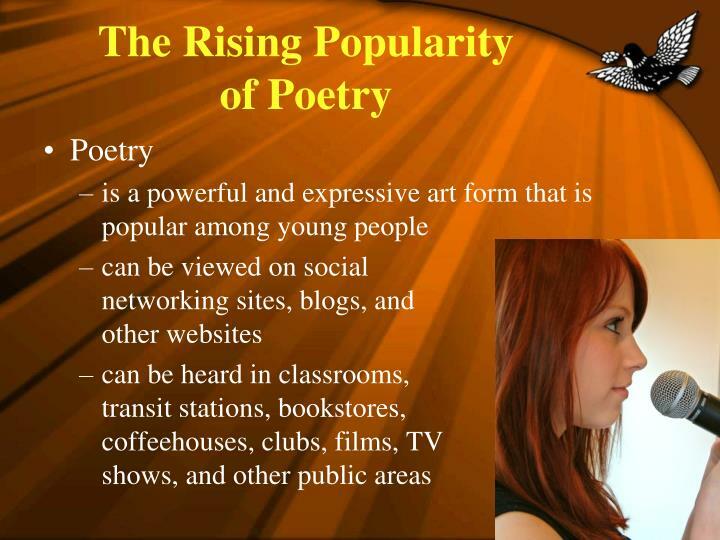 Poetry is one of the world’s oldest art forms. 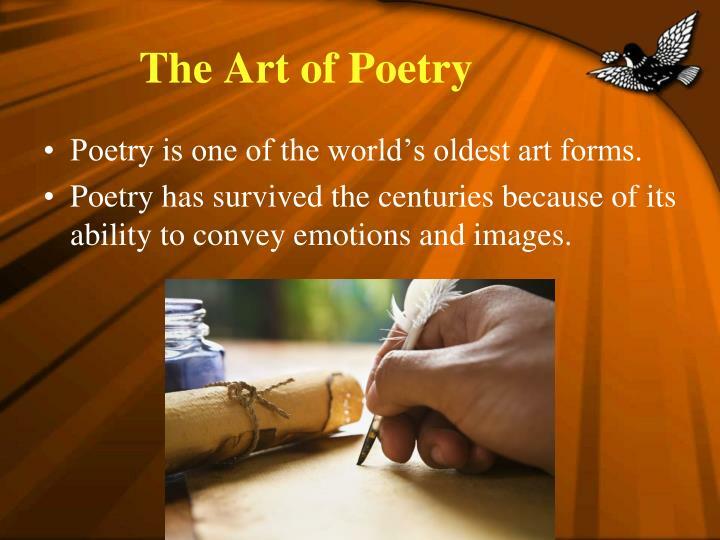 Poetry has survived the centuries because of its ability to convey emotions and images. 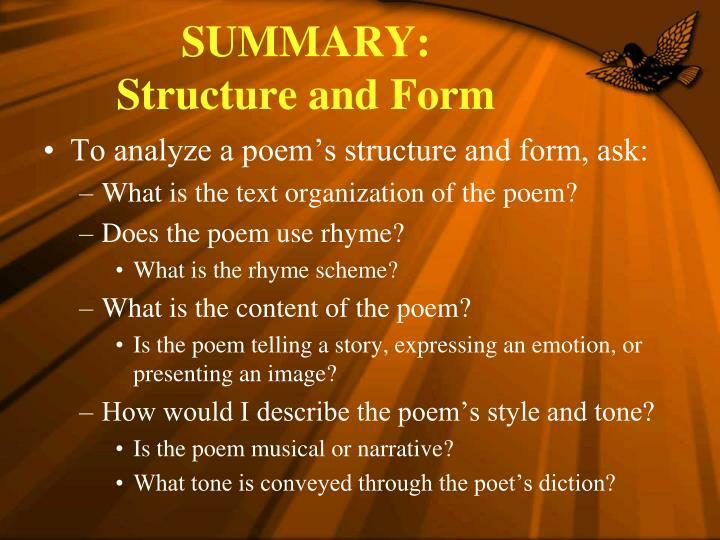 How can the structure and form of a poem provide clues about the author’s purpose in creating it? Poetry isn’t written from the idea down. It’s written from the phrase, line and stanza up…. 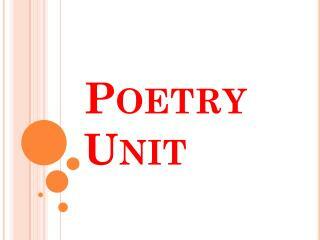 When composing a poem, a poet explores various poetic structures and forms to express his or her ideas. 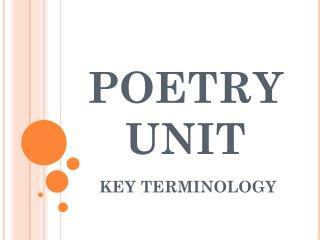 Some poets conform to formal conventions of poetry, such as the use of stanzas, meter, and rhyme schemes. Others choose to write freely without the constraints of established text structures or line patterns. 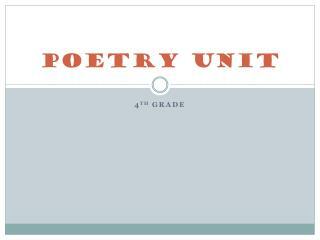 No matter what format a poet chooses, it is important for readers to recognize the structures and forms of poetry. This helps them to understand the author’s intention and appreciate the interplay of words. 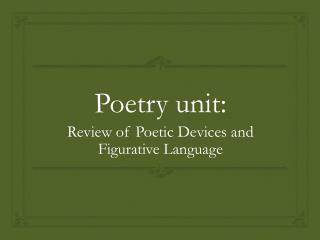 The text organization of poetry distinguishes it from prose. 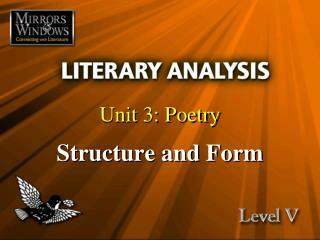 Stories and essays are divided into paragraphs, but poems are often divided into stanzas, or groups of lines. 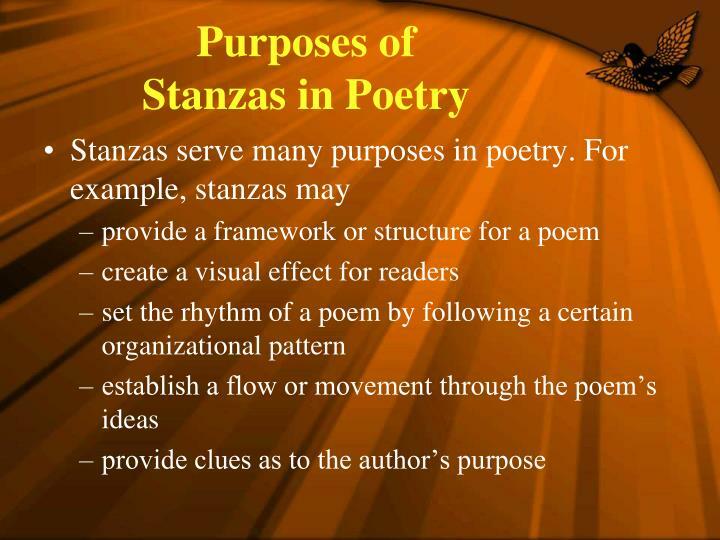 There are several types of stanzas that a poet can use when creating a poem. 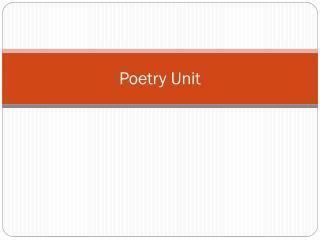 The type of stanza is determined by the number of lines. 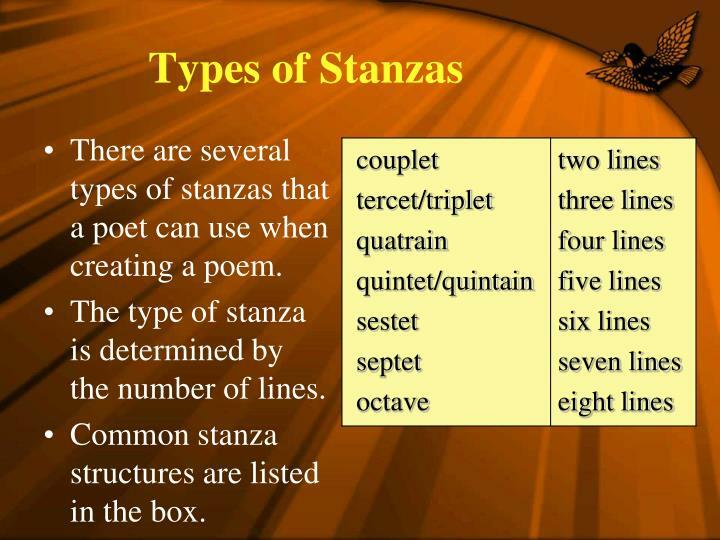 Common stanza structures are listed in the box. 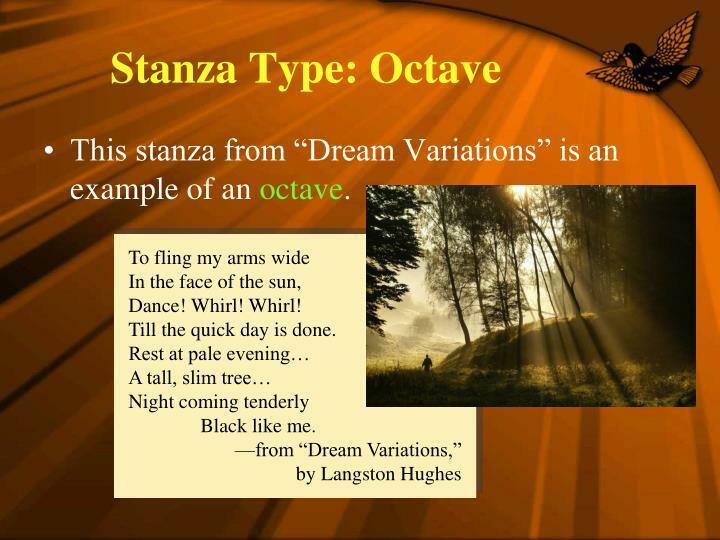 This stanza from “Dream Variations” is an example of an octave. 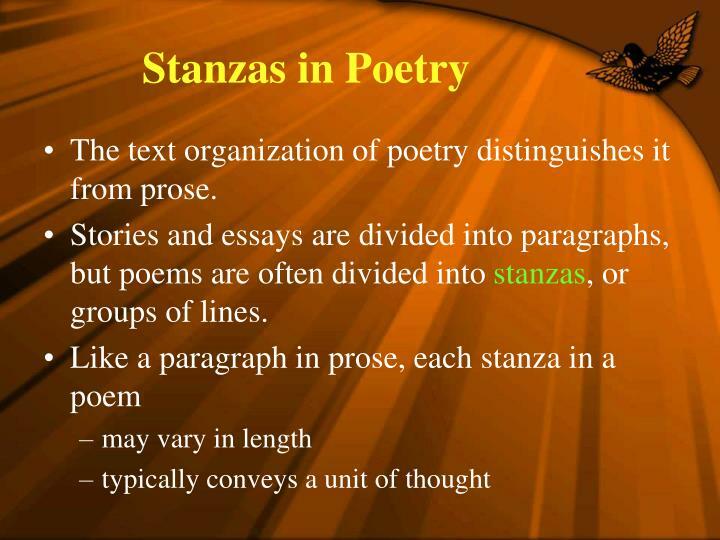 The blank spaces between stanzas are called stanza breaks. 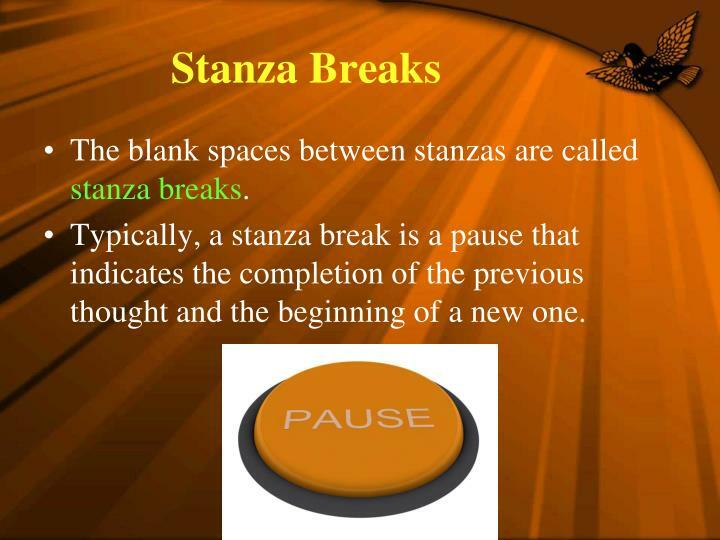 Typically, a stanza break is a pause that indicates the completion of the previous thought and the beginning of a new one. 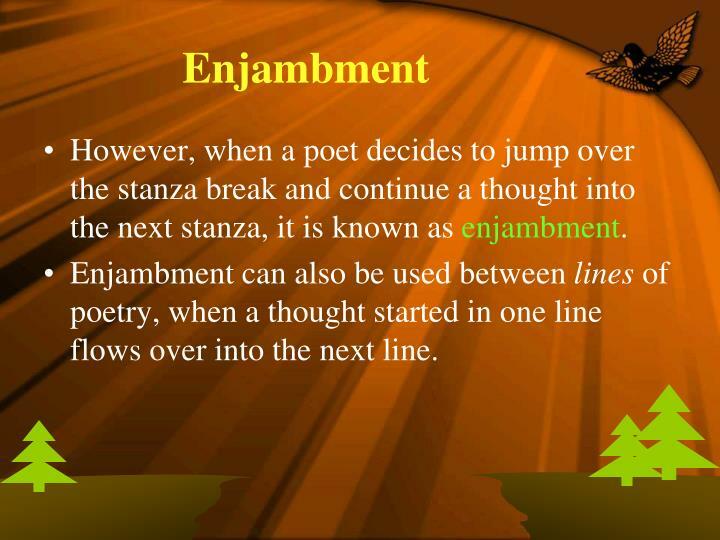 However, when a poet decides to jump over the stanza break and continue a thought into the next stanza, it is known as enjambment. Enjambment can also be used between lines of poetry, when a thought started in one line flows over into the next line. A tanka is a traditional Japanese poem consisting of five lines. The first and third lines have five syllables. The other lines have seven syllables. 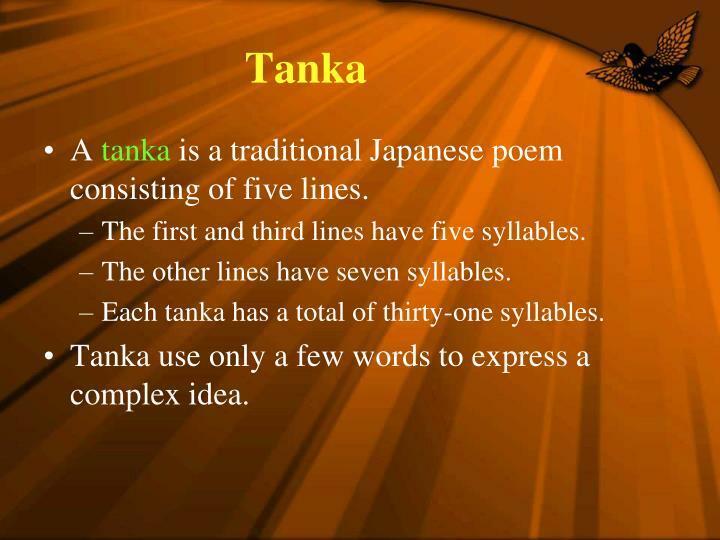 Each tanka has a total of thirty-one syllables. Tanka use only a few words to express a complex idea. 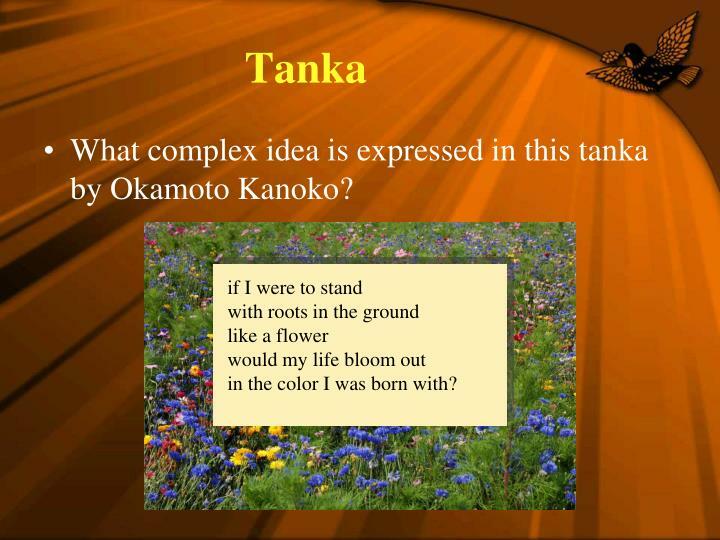 What complex idea is expressed in this tanka by Okamoto Kanoko? in the color I was born with? 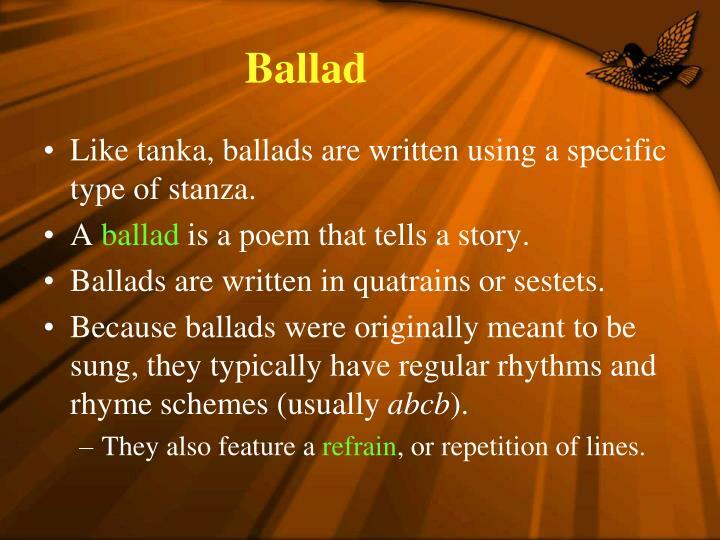 Like tanka, ballads are written using a specific type of stanza. A ballad is a poem that tells a story. Ballads are written in quatrains or sestets. Because ballads were originally meant to be sung, they typically have regular rhythms and rhyme schemes (usually abcb). They also feature a refrain, or repetition of lines. 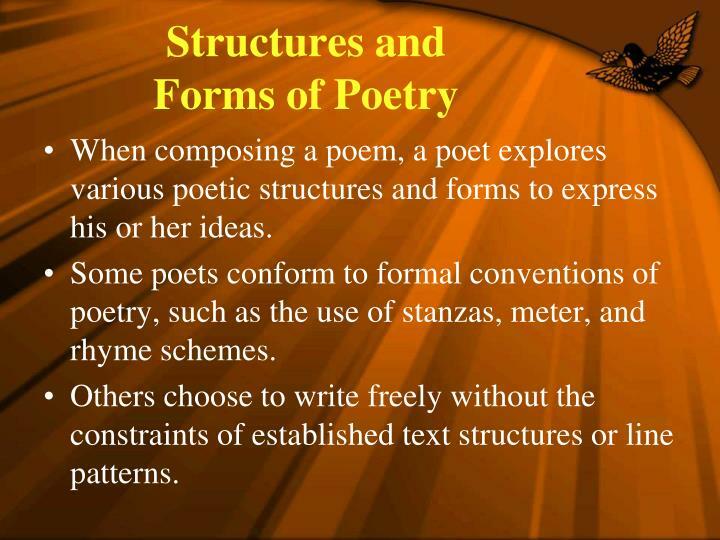 Sonnets are another type of poem that follow a specific stanza pattern. 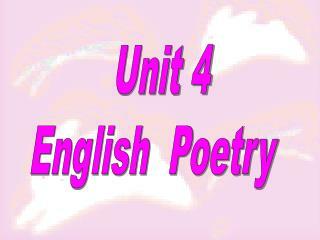 A sonnet is a fourteen-line poem written in iambic pentameter. Iambic pentameter means that the lines are formed using five iambs. An iamb is an unstressed syllable followed by a stressed syllable, such as in the word refrain. 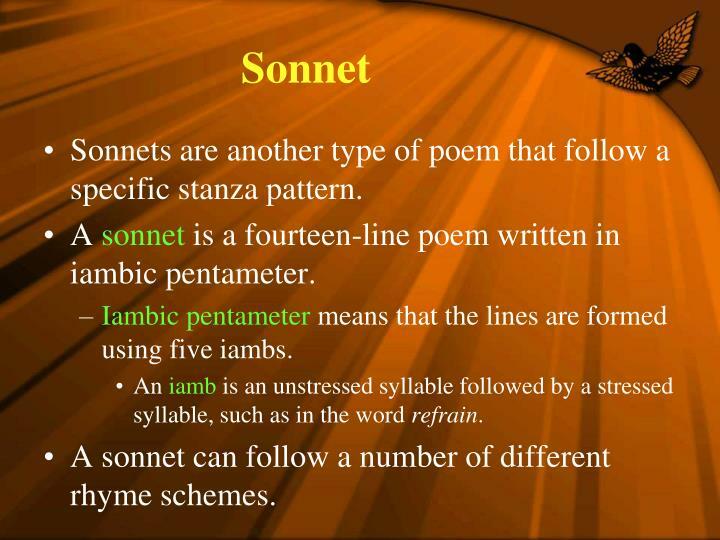 A sonnet can follow a number of different rhyme schemes. 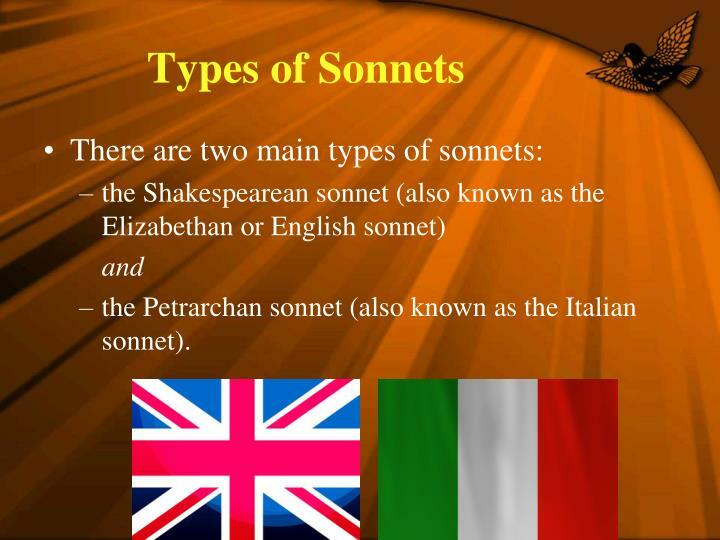 the Petrarchan sonnet (also known as the Italian sonnet). a final couplet (two-line stanza). 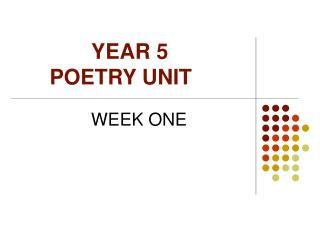 The rhyme scheme of a Shakespearean sonnet is abab cdcd efef gg. 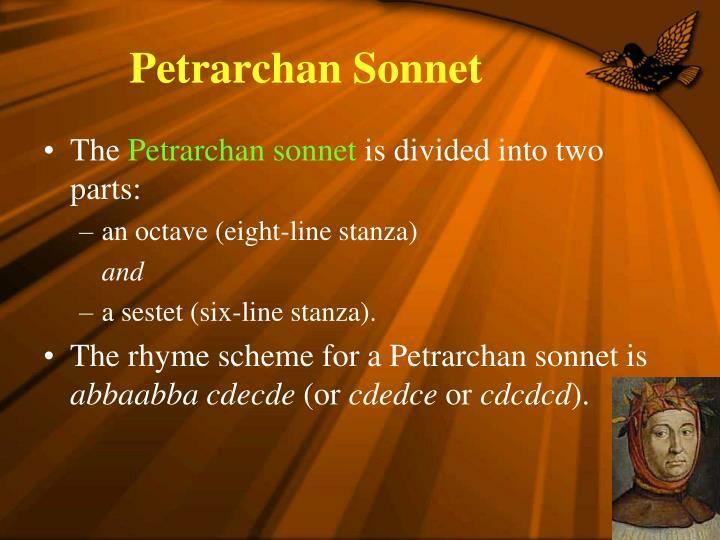 The rhyme scheme for a Petrarchan sonnet is abbaabba cdecde (or cdedce or cdcdcd). 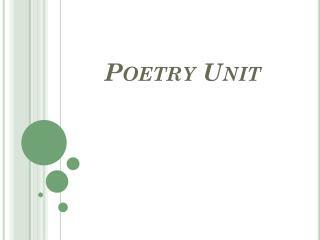 It is important for readers to be familiar with the various forms of poetry. 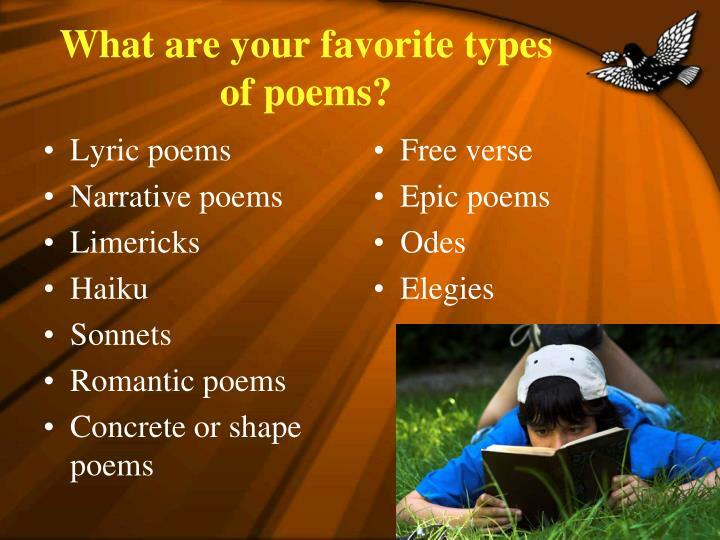 Poets choose particular poetic forms to suit their content. 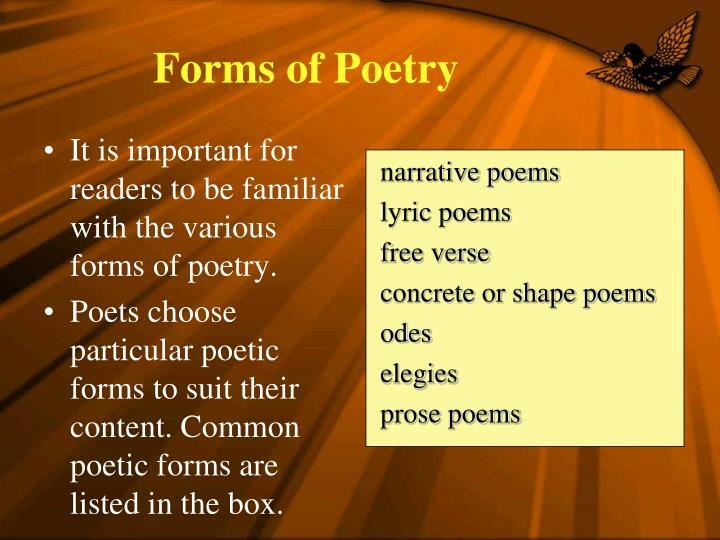 Common poetic forms are listed in the box. A narrative poem is a poem that tells a story. 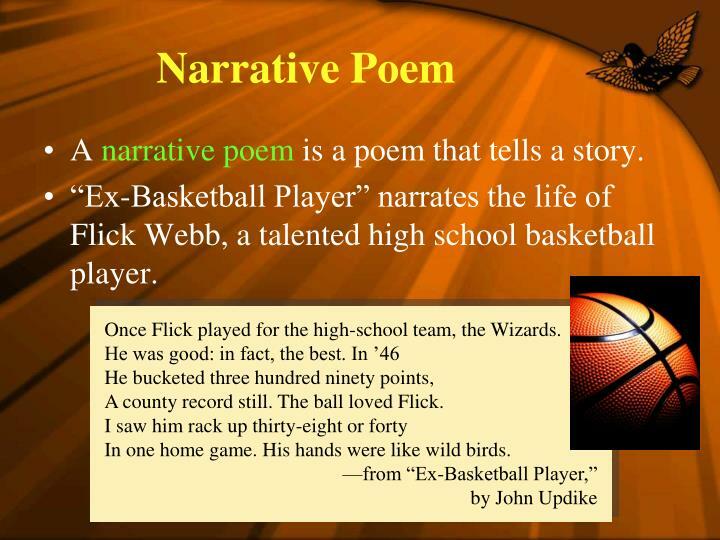 “Ex-Basketball Player” narrates the life of Flick Webb, a talented high school basketball player. 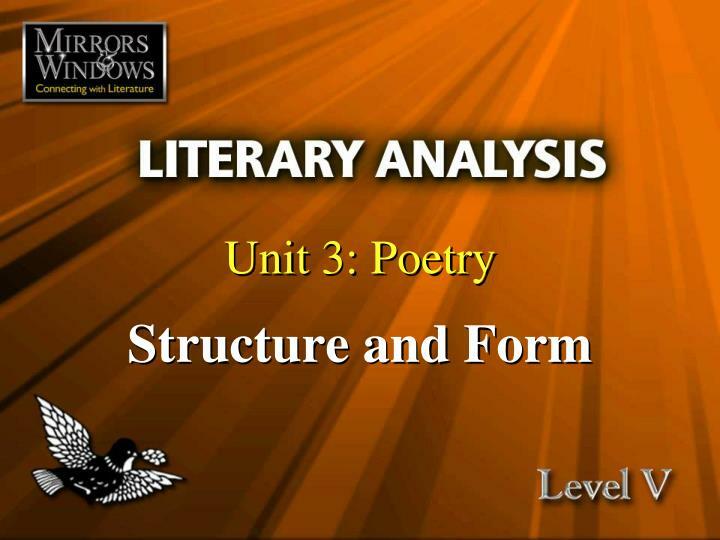 A special type of narrative poem is the dramatic poem. 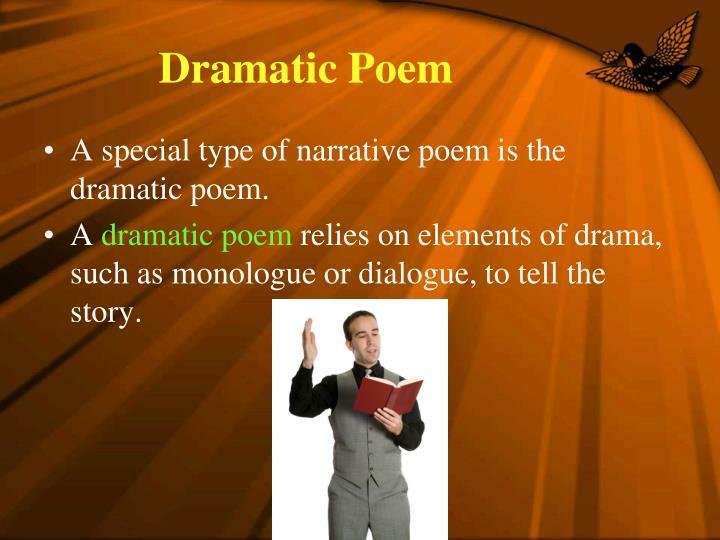 A dramatic poem relies on elements of drama, such as monologue or dialogue, to tell the story. 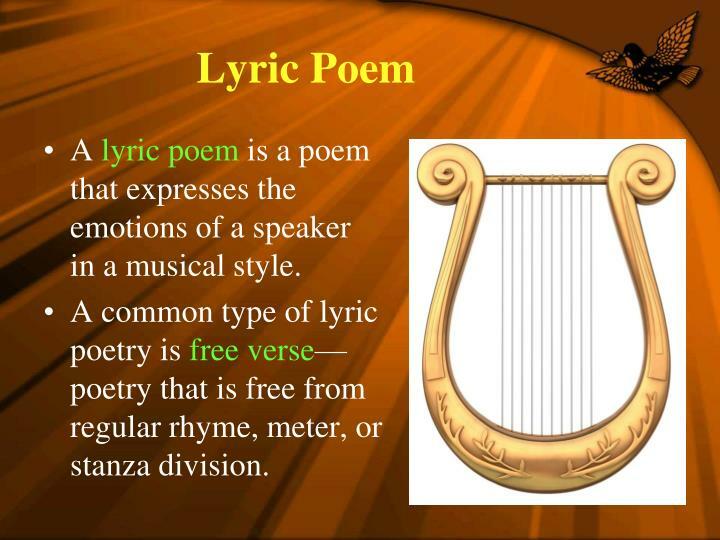 A lyric poem is a poem that expresses the emotions of a speaker in a musical style. 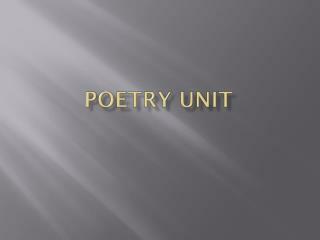 A common type of lyricpoetry is free verse—poetry that is free fromregular rhyme, meter, orstanza division. 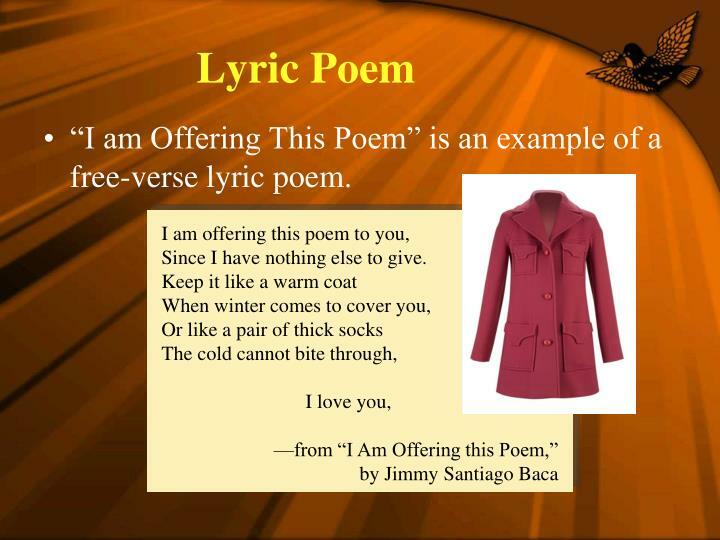 “I am Offering This Poem” is an example of a free-verse lyric poem. 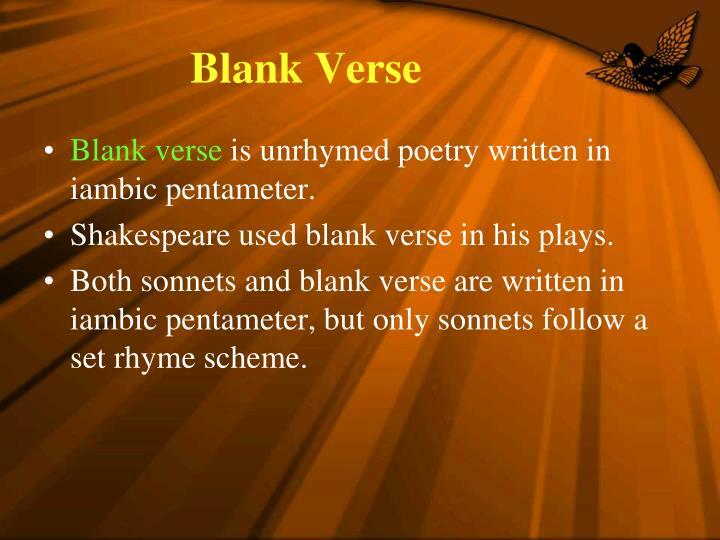 Blank verse is unrhymed poetry written in iambic pentameter. Shakespeare used blank verse in his plays. 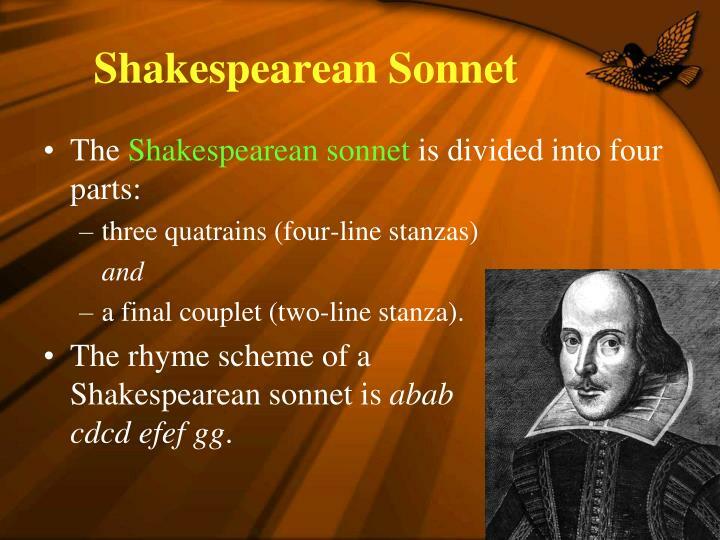 Both sonnets and blank verse are written in iambic pentameter, but only sonnets follow a set rhyme scheme. Some passages of prose make such extensive use of poetic language that the line between prose and poetry is blurred. These passages are called prose poems. 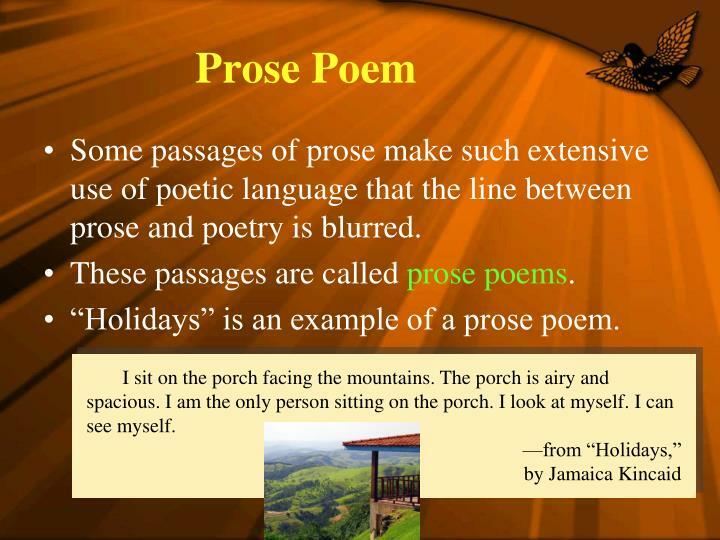 “Holidays” is an example of a prose poem. I sit on the porch facing the mountains. The porch is airy and spacious. I am the only person sitting on the porch. I look at myself. I can see myself. 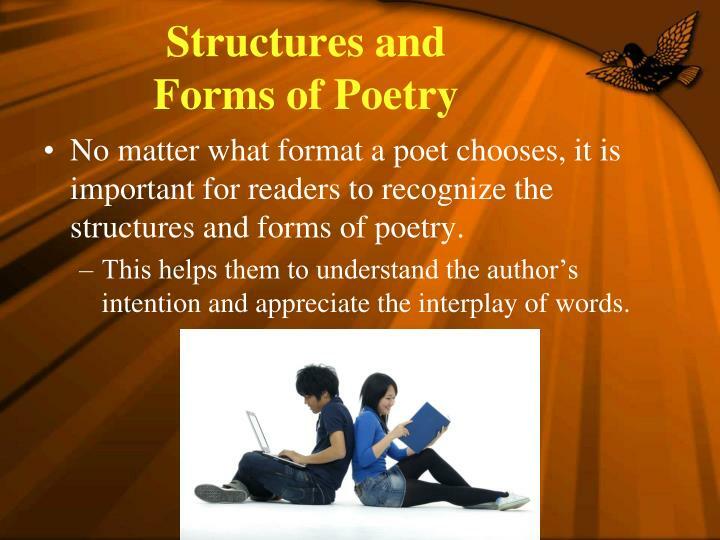 Two other poetic forms are based on the purpose of the poem. 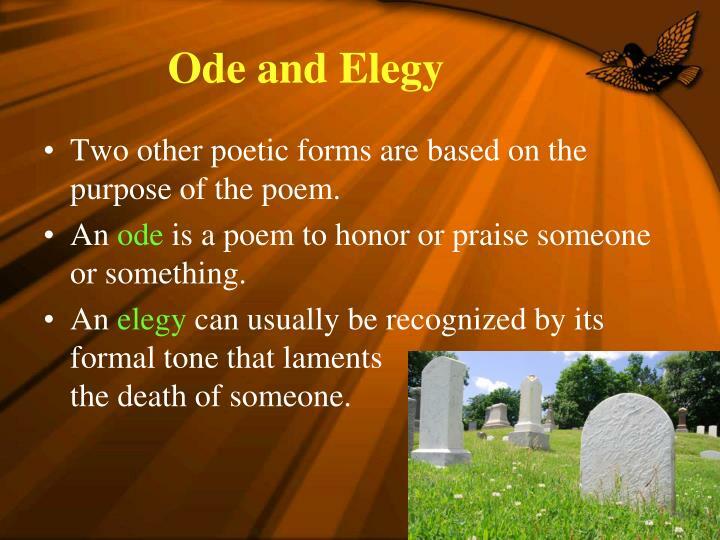 An ode is a poem to honor or praise someone or something. An elegy can usually be recognized by its formal tone that laments the death of someone. What is the text organization of the poem? Does the poem use rhyme? What is the content of the poem? Is the poem telling a story, expressing an emotion, or presenting an image? How would I describe the poem’s style and tone? 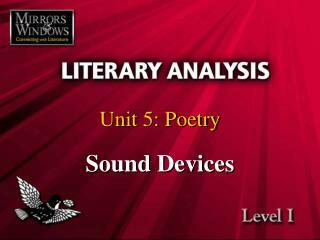 Is the poem musical or narrative? What tone is conveyed through the poet’s diction? 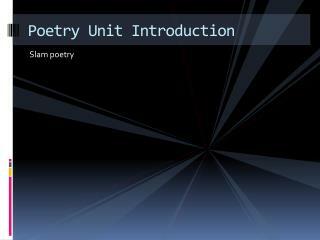 Poetry Unit Introduction -. slam poetry. slam poetry. 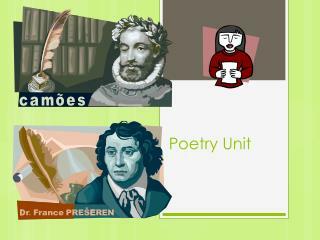 listen to this link of omar musa http://www.youtube.com/watch?v=3u8dz50gbvk&amp;feature=related blog on edmodo what do you think the poet’s message is ? 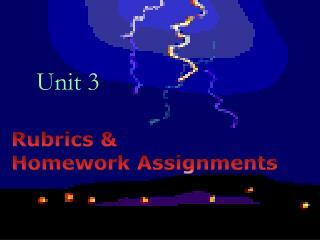 http://www.edmodo.com/home. 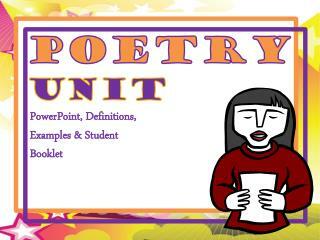 POETRY UNIT -. key terminology. q: what is the definition of form?. 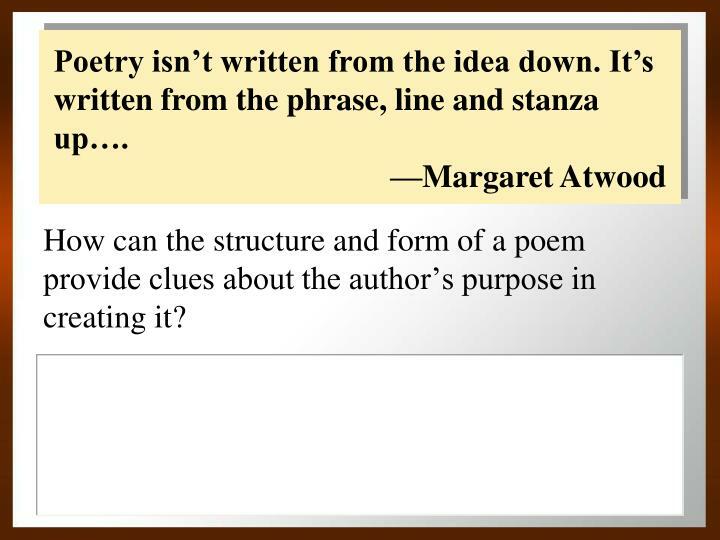 a: the way a poem looks on a page. 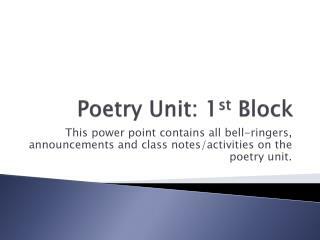 September 25 – Poetry Unit Intro -. 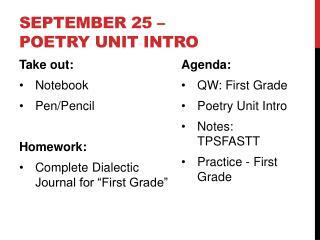 take out: notebook pen/pencil homework: complete dialectic journal for “first grade”. 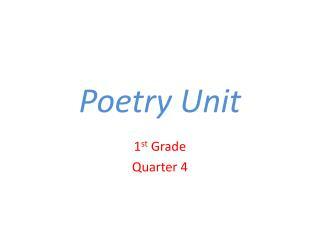 agenda: qw: first grade poetry unit intro notes: tpsfastt practice - first grade. quick-write: first grade.